This talk, titled “Why we get old and die, and what to do about it” was presented in the amphitheatre of the Redpath Museum, on 2018-10-11. Download a pdf of the slides and my speaker notes. I made a presentation about my classifier to Emily Coffey, at the time a PhD candidate in the Cognitive Neuroscience Lab at the Montreal Neurological Institute, and her colleagues, on 2011-1-21. Download a pdf of the presentation slides and notes. This presentation was part of a conference on Aromatherapy, given jointly by Lydia Nassar, nurse in the Inpatient Stabilization Programme, and myself, at Ste. Anne’s Hospital. Click to download a pdf of the presentation slides and notes. Conference given at Ste. Anne’s Hospital on 2007-9-18, as part of the Department of Psychiatry Conference Series. Download a pdf of the lecture slides and notes. Does too much sleep cause depression? This presentation was made to the GPs at Ste. Anne’s Hospital. Download a pdf of the presentation slides and notes. Should we give Vitamin B12 to all our elderly patients? Presented at Clinical Grand Rounds, SMBD-Jewish General Hospital Department of Psychiatry, ICFP Amphitheatre, on 2004-12-9. Download a pdf of the presentation slides and notes. Financial abuse of vulnerable seniors: are we part of the problem or part of the solution? This presentation was part of a panel discussion at the Community Conference: Protecting the vulnerable: the financial abuse of the elderly. Gelber Conference Centre, Montreal, on 2004-6-10. Download a pdf of the presentation slides. Looking after our own health: what can we do? Presentation as part of a panel discussion, AMI-Quebec, Montreal, QC, on 2003-11-24. Download a pdf of the presentation slides and notes. Training session for personnel participating in “Depression Screening Day”, CLSC René-Cassin, Côte St-Luc, QC, 2001-10-2 Download a pdf of the slides and notes. Fatigue and sleep in cancer and fibromyalgia: can too much sleep be bad for you? This was an invited lecture, given at Grand Rounds, Department of Rehabilitation Medicine, National Institutes of Health, Bethesda MD on 2000-6-16, and again that day at Grand Rounds, Rheumatology Department, NIH. Download a pdf of the presentation slides and notes. Fatigue and sleep in cancer: Can too much sleep be bad for you? Does excessive sleep cause insomnia, depression and fatigue? 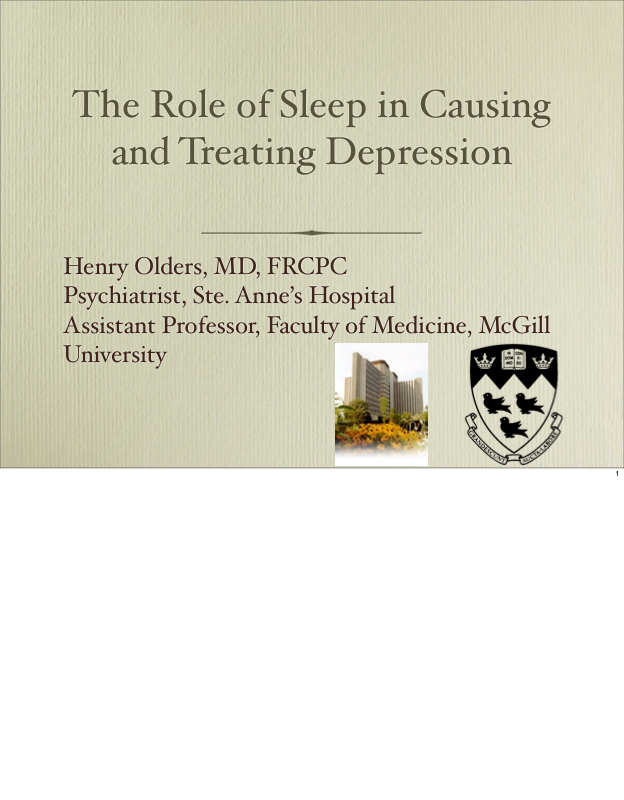 This presentation was given at the Sylvia Hamovitch Day Conference on 1996-11-29, put on by the Psychogeriatrics Service of the Department of Psychiatry, Jewish General Hospital, Montreal, QC. Download a pdf of the slides and notes.